Encourage the use of appropriate humor, laughter can have healing power – e.g. can you find the humor in a situation? Diffusing a tough situation, finding a way to cope can often be done with the use of humor. As with discovering how to communicate and problem-solve individually and with others, being able to appreciate and use humor appropriately requires a sense of self-acceptance, self-confidence and empathy towards others. Among the competencies our team is working to develop through PocketConfidant’s virtual coach is the ability to help people discover and build their awareness of self-acceptance and self-confidence. SKILL 10: Being able to take care of yourself, e.g. diet, exercise, financial “health”, etc. Paying attention to what you are eating, getting enough sleep, exercise, etc. e.g. making a plan to meet a friend for a walk/run. The quote we all know so well: “you have to first take care of yourself before you can take care of another” is crucial to our health and wellbeing but often forgotten in a crisis. Through the questioning dialogue with the virtual coach these reminders can be naturally included in any conversation leading towards an objective or outcome, as the deep questioning cycle which checks on resources and one’s ability to take control of ones’ life brings the health and wellbeing questions to light. Self-coaching programs that will be imbedded into the system also serve as a reminder to take care of the whole person. Our goal is to make technology smart enough to help people master their own approach for customized and self-paced success. Occupations and volunteer activities that involve caring for others can often build resilience – e.g. volunteer in a shelter or food bank. As members of a well-functioning family, community and society we must be willing and able to care for others when needed. Our ability to successfully do so is in direct relationship to how we feel about ourselves and our ability to see the bigger picture. Caring for others physically and emotionally requires us to be attentive, to put our own interests and problems aside, and be willing to accept and provide what support we can for what others are going though. Having the capacity to do this in a constructive and altruistic way is a strong measure of our personal resilience. We think technology can help people develop their own resilience as identified through these skills and bring meaning and purpose to their own lives. The above is not a finite list but an inventory of attitudes commonly cited in the literature to be instrumental in building resistance in individuals. We encourage the reader to be creative, adding their own suggestions of skills they find useful. Please share with us the skills you have used, and the context in which you have found them helpful. 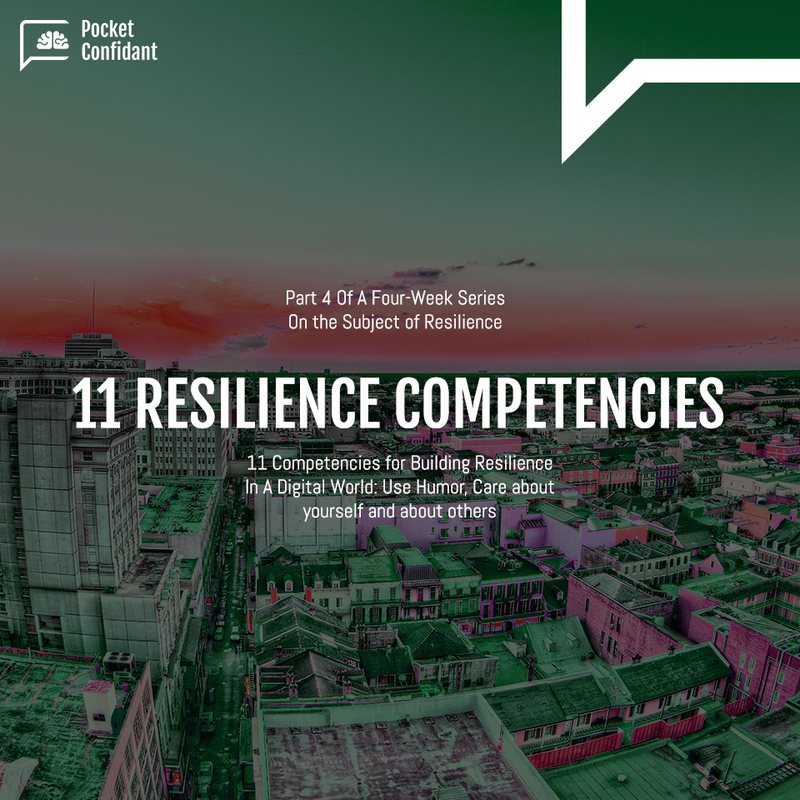 We trust you have enjoyed this fourth and final part of our article on resilience. We would love to hear from you, whether you are a follower of tech and the current conversations around Artificial Intelligence, or if you have never considered the potential of applying Artificial Intelligence in such a context. What are your thoughts? How does reading this article make you feel? Have you encountered some of the situations or skills that are mentioned here? Are you a mobile device user trying to solve personal and day-to-day life issues on your own? How do you feel about the fast pace and constant development of science and technology? Stay tuned for next weeks’ series. Contact us to share any thoughts, we will read with great curiosity and interest.